The Scoop offers an alternative to the ubiquitous K-cup brewer, ideal for anyone who wants an easy, single-serve coffee maker that doesn’t need a cup or pod. 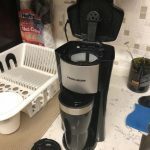 This simple-to-use single serve coffee maker relies upon your own coffee grounds and can brew a standard 8-ounce cup or a 14-ounce travel mug. The Scoop is designed to fit most 14-ounce travel mugs comfortably. Using your own grounds can produce a better-quality cup of coffee at a more affordable price. In terms of appearance, this little coffee maker is perfect for the modern kitchen, with a full stainless steel finish with black plastic accents. It’s sleek, with a curved shape and no harsh edges. It’s also small, at 8.67 H x 6.7 W x 8.35 D. It fits tidily in the smallest studio apartment kitchen, but won’t look out of place in a larger one. The small size and quality performance is also an ideal choice for the dorm, office or RV. Hamilton Beach has designed this coffee maker for speed, coffee quality and heat. The Scoop brews an 8-ounce cup of coffee in only 90 seconds, and brews it hot. The larger cup takes less than 2 ½ minutes from pressing the brew button to drinking a steaming hot cup of coffee. 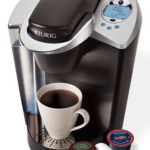 While this is an easy-to-use single serve coffee maker, it does let you choose your brew strength from regular or bold. The bold setting takes a bit longer for a stronger and fuller-flavored cup of coffee. You can, of course, also choose a stronger, darker roast for a bolder cup of coffee. Since you’re choosing your own coffee grounds, you can opt for a finer grind for a stronger, albeit slower, brew. Hamilton Beach’s included filter cup has two line markings, one for 8 ounces and one for 14 ounces. Here’s the reason it’s called The Scoop. The reusable, high-quality steel filter doubles as a coffee scoop, so there’s nothing else to find, use or wash. Simply scoop to fill the filter cup for the coffee cup size you want and add water. You’ll add just enough water for the cup you’re brewing—fill and pour using your coffee cup. You can use your own mug or the included stainless steel travel mug. Adjust the cup rest to the correct point for your cup, and push a button to brew. A wide drip tray and non-skid bottom keep your kitchen as clean as this coffee maker looks. The drip tray adjusts to hold either a smaller or larger cup, providing for consistent, high-quality performance. For a smaller mug, push the drip tray up to place the cup as high as possible to prevent any overspray and keep your kitchen clean. The rounded shape isn’t just attractive—it also means there’s nowhere for old coffee to collect! All three removable parts are dishwasher safe for easy clean-up. You’ll only have three removable parts with this coffee maker; the Scoop, a filter basket, and the drip tray. The coffee maker itself can easily be cleaned with a soft cloth, and should be cleaned internally regularly with white vinegar. The Scoop has an auto shut-off for safe use; there’s no need to worry about remembering to turn off your coffee maker on a busy morning. If you want to use your own ground coffee, The Scoop is an ideal single-serve coffee maker choice. It can produce a small cup or a larger mug, and fits most travel mugs for ease of use. There’s little clean-up or maintenance, and the coffee ends up where it belongs—in your coffee mug. The speed, value, and function of this little single serve coffee maker makes it a favorite. Some coffee drinkers, particularly occasional drinkers, find having to keep ground coffee or beans and a grinder available, inconvenient. For those people, a pod or cup-based system may be a better and more practical choice. In addition, some users, especially if they need to brew multiple single cups, would prefer a coffee maker that holds more water to reduce the need to refill for individual cups. Watch this video review of The Scoop by Hamilton Beach right here. Hamilton Beach Company Profile - We Love These Guys!